The shorter wavelength of 1MHz systems can cause them to give 'nearsighted' velocity measurement in a typical waste water application. 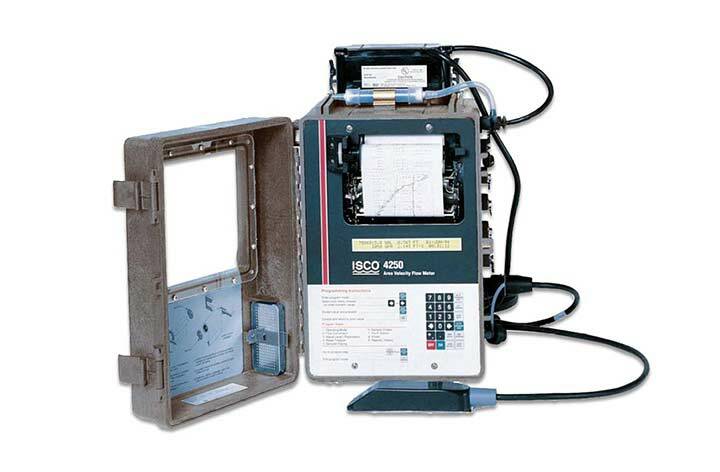 Isco's exclusive 500 kHz Doppler that's used in the 4250 can penetrate further into deep flow streams. The 4250 can give greater accuracy where full pipe, submerged, reverse flow or surcharged conditions occur, and where weirs or flumes are not practical. Setup using 160 character LCD screen with built-in keypad, or via a connection to a PC running Flowlink software. Built-in flow conversions for most applications including data points, Manning formula, or equations if needed. 10ft (standard) or 30ft (extended) level measurement range. Accurate on-site printouts using built-in dot matrix printer. Large internal memory can store 2 months of flow, parameter, rainfall and sample data taken at 15 minute intervals. Inputs for water quality sonde and 674 Rain Gauge. Sealed sensor that resists fouling by oil and grease. Streamlined shape shreds debris. Provides interface for sampler activation and alarm outputs. Program Memory Non-volatile, programmable flash. Updateable without opening enclosure. Weight, incl. cable 2.1 lbs (0.96 kg) for standard probe with 25 foot cable; 3.9 lbs (1.8 kg) for extended range probe with 50 ft cable. Standard probe accuracy (Non-linearity, repeatability, and hysteresis at 25°C (77°F). Max error for indicated level range. Extended Probe Accuracy (Non-linearity, repeatability, and hysteresis at 25°C (77 °F). Max error for indicated level range.